A Purdue Pesticide Programs has released a new publication titled “Understanding the Horse Trailer Rig: Steps for Transporting Horses Safely on the Highway” (PPP-114). This publication provides information about what it takes to safely attach a livestock trailer to a truck. 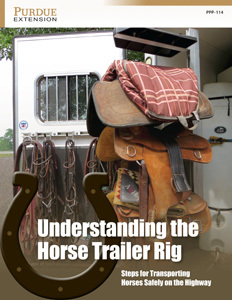 It provides examples of maintenance issues you need address as part of “the rig.” While we emphasize safely transporting horses in trailers, the same principles hold true for transporting other livestock. Language: English. Format: Book and PDF. Pages: 56.